English professor Matt Pavesich led his WRIT 015 students in an experimental new course to design escape rooms for Lauinger Library. Georgetown students Lizzie Hyman (C ’21) and Emma Victoria (C '21) explain their groups' proposals and show off props and clues created with Maker Hub materials in this video. Science Technology and International Affairs professor Colin McCormick advised his students in developing low-cost air quality monitors in his class STIA 315: International Air Quality Lab. 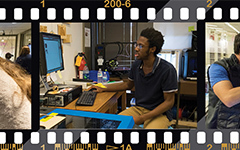 Students used Maker Hub materials such as 3d printers and arduinos to design these monitors. Catesby Wolski (SFS '18) is featured in this video describing her experience! The Living Futures: Biodesign studio class (STIA 411) created two unique project ideas for a BioDesign Challenge. Zack Abu-Akeel (SFS '18) describes them in this video: Pipe Angioplasty, which models our urban systems after our biological systems in order to diagnose city water leaks; and Blue Space, which rethinks how we promote sustainability using urban structures on a college campus. The class used materials from the Maker Hub to model their projects. Dive into these stories to learn more and get inspired. What could your Maker Hub story be?